Au revoir cheese fondue with crusty French bread! Adios ooey gooey cheese enchiladas and nachos smothered in golden deliciousness! Arrivederci thin-crust pizza with fresh mozzarella! Auf Wiedersehen wheat beer with warm soft pretzels! Goodbye New England clam chowder in a sourdough bowl! Recently I received devastating news: I have to remove all gluten and casein (dairy) from my diet. Although the results of the test were not a surprise, I was still crushed. I kept shouting over and over again to myself: No! No! No! This doesn't fit with how I see myself. I'm easy going. I go with the flow. I'm someone who can do and eat whatever she wants! That night, I dreamed about a Godzilla-sized cheese sandwich. It doesn't take a genius to parse out the meaning of my nocturnal wishful thinking. Not only have I devoted my life to food, I am a self-declared Francophile with a Master's degree in French Cultural Studies. I wrote my thesis on the history and sociology of eating in France! How would I be able to travel in France and not enjoy the bounty of 365 different cheeses or the amazing array of bread? Catering for large groups is my passion and my livelihood. How can I prepare meals for guests if I can't taste the food? As my mind raced and my tone became increasingly whiny, I started to wonder if there was a chance that I was actually lucky. Rather than seeing my (a)vocation and my food sensitivities as being at odds with one another, maybe this was a blessing. I could try to use my knowledge and love of food to my advantage. Perhaps this could me my opportunity to expand my horizons and experience new culinary delights. 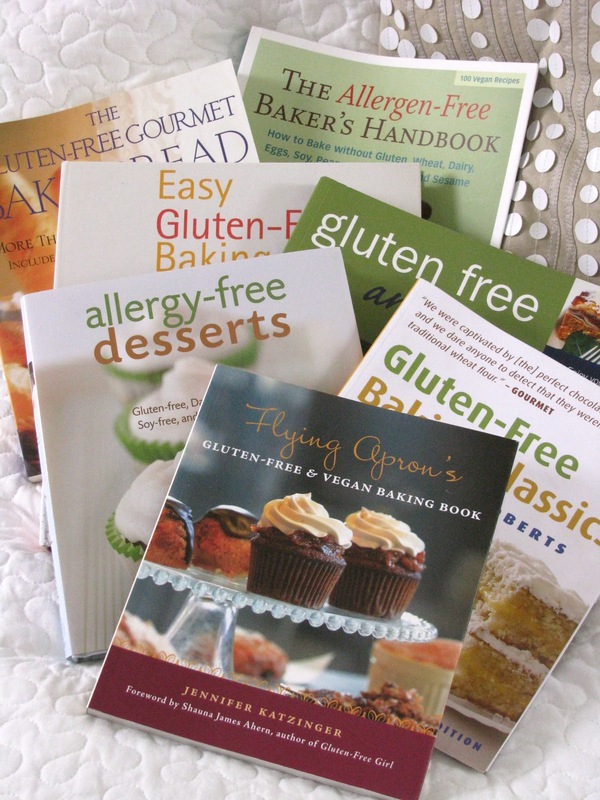 Armed with an arsenal of gluten-free and allergen-free cookbooks, I decided to go on the offensive. I resolved to turn this challenge into an opportunity. I may not be able to travel in the same way as I used to or dig into a vat of fried chicken at the next tailgate party, but there is a new world of unusual grains and flours to explore and a world of untapped allergy-friendly dishes waiting to be discovered. I will have to be creative and force myself to look at food preparation in new ways, but I'm hoping that this will be part of the fun. Although I'm still getting used to the idea of giving up freedom, flexibility, and microbrews, I'm also excited to be embarking on this new adventure. As I continue on this journey, I look forward to sharing my discoveries with you. What challenge in your life could be turned into an opportunity? What steps could you take today? For me, the first step was ordering a slew of cookbooks that would teach me more about cooking and baking without gluten and dairy. The second step was to imagine the positive that could come from my so-called travesty. Surprisingly, I realized my situation wasn't as earth shattering as I had originally thought. By pushing myself to think creatively and make an effort to expand my parameters, I found an opportunity and maybe you will too. Let me know. I'd love to hear your story. I love mashed potatoes, but without being able to use butter and cream, I've been feeling at a loss this holiday season. With sweet potatoes instead of white potatoes and coconut milk in place of the dairy, I developed this ambrosial combination. No one will even know that it's an "allergy-friendly" alternative. It's that good! The alluring spice combination was inspired by an old recipe from Bon Appetit magazine, and the rest comes from forcing myself to push the boundaries of my cooking repertoire. The spices in this recipe are subtle. If you'd like a stronger flavor, increase the amount of ginger juice and Chinese five-spice. *To make coconut "cream", chill a can of coconut milk (not light) in the refrigerator for at least a few hours. Do not shake the can before chilling as you want the creamy solids to rise to the top. Scoop 1/3 cup of the solid "cream" from the top to use in this recipe. Use the remaining coconut milk to make piña coladas or Thai curry. Do not use the "coconut cream" that is found in many grocery stores. It is contains sweeteners and thickeners and will not work in this recipe. Bring a large pot of water to a boil. Add the sweet potatoes and simmer until they are soft but not mushy, about 10-15 minutes. Drain well. Return the sweet potatoes to the pot and add the coconut "cream" and mash until smooth. Add the ginger juice, Chinese five-spice powder, and salt. Mix to combine. Enjoy! Young and old alike will enjoy these mashed potatoes. Babies love these mashed sweet potatoes just as much as adults! yummy!! i feel blessed to know you'll be posting more of these amazing dairy free recipes. maybe that'll become your food savoring niche. :) you are an amazing cook no matter what your ingredients. i'm excited to see more. Meadow - You have taken a lemon and made it into lemonade!!! I love your continued grace. Very inspiring Meadow!! Love the way you shifted your perspective about the situation! I'm going through the same type of transition to Gluten, Dairy, and Soy free diet and finding it very challenging. You are giving me hope (and ideas)! Your new niche will be helping many at a deeper level..
Meadow, I am looking forward to your journey in finding new ways to prepare the foods you love. I have been experimenting with recipes for 2 years now because my Grandson is deathly allergic to all Dairy (not just Cow), Eggs, and Peanuts. It is a challenge, but an interesting one. I can't wait to see the new twists you add to your recipes! I appreciate your willingness to share your journey, embrace the new, & inspire with your enthusiasm for blazing new trails! As you say, there are so MANY good choices, & so MUCH good information available to us at this time!